The Power Station is pleased to announce “Generations”, an all-ages art-making event produced in collaboration with Oil and Cotton and The Writer’s Garret. 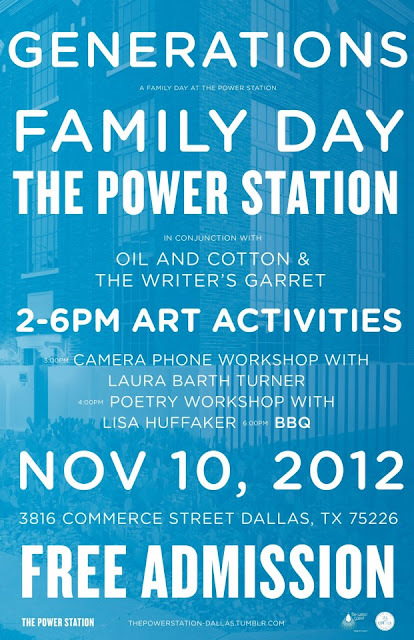 “Generations” will feature an interactive, freeform booklet designed by Oil and Cotton. Visitors will complete visual and written activities within the booklet by visiting stations placed around the grounds of The Power Station. Prior to taking their one-of-a-kind booklet home, participants will have the option of scanning in pages to be featured on The Power Station’s Tumblr page. Additionally, two workshops will be held on the 3rd floor of the building. The first is an iPhone photography workshop with artist Laura Barth Turner; organized by Oil and Cotton. The second is a poetry workshop with writer Lisa Huffaker; organized by The Writer’s Garret. The event will culminate with a free barbecue, beginning at 6:00pm. This summer we were lucky to work with many special people during our ZINE CAMP collaboration with The Writer's Garret. Bringing our students together with working artists is important to our mission as a community art exchange. Making these interactions possible leads to long lasting connections and art making experiences that might not happen otherwise. And most importantly our kids LOVE working directly with artists, and that feeling is equally reciprocated by our artists! Artist and Oil and Cotton family member, Matthew Cusick joined the camp to discuss his DEFACEMENT work, a series pages from old schoolbooks that are altered by sanding and scraping away everything except the page number, an illustration, and a few chosen words. Our zine makers used what they learned from Matt to create "erasure" poems with found text. Below is an example of Elijah's poem in his COLOR zine. A rainbow of colored tapes were used to create his "erasure" poem inspired by his love of art and John Lennon. Collage artist and all around super lady Brandi Strickland sent a special delivery to Oil and Cotton from her home in Virginia. Zine campers opened a brown paper wrapped box to discover colorful pages from magazines, old book pages, exotic packaging labels, vintage stamps and more gleaned from Brandi's personal cache of collage papers. See Brandi's response to our thank you package here! Below are examples of collage made with Brandi's paper collection. 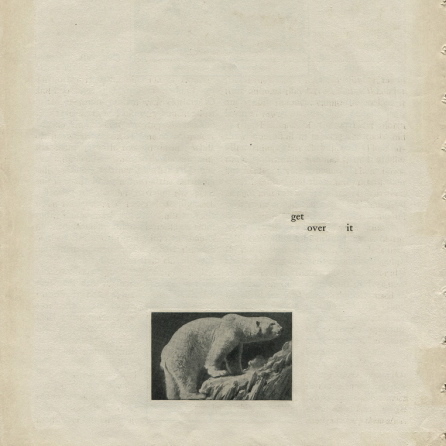 Notice the difference between the original collage and the black and white photocopied zines. Mylan Nguyen and Jessica Trevizo set up a silk screen studio in Oil and Cotton and taught students about the printmaking process. Students printed their book covers with original artwork created especially for the zine camp by Myaln and Jessica. Thank you to the artists, students, and teachers that helped to make this the best summer camp ever! Look for new zine camps this spring! Dates will be announced in November. 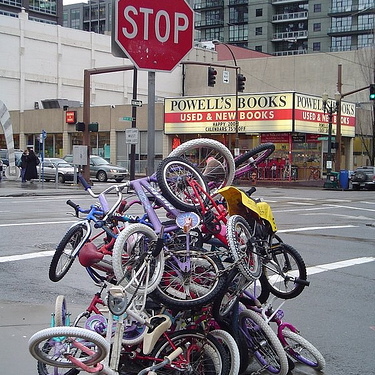 We have all used a tree, lamp post or stop sign as a makeshift bike rack at one point or another. Fred Pena of the Back Porch Studio is taking steps to avoid bike pile-ups like above and YOU can be a part of the movement through our BIKE RACK DESIGN/BUILD COMPETITION. This project is a design competition; following these instructions and using the drawing packet (available here) as a guide you will design an entry and submit it for consideration by SATURDAY, DECEMBER 1, 2013. Saturday December 1st to complete and submit your design entry. The construction part of the project will occur at a later date to be announced in early 2013. This competition is a collaborative project created by The Back Porch Studio, Oil and Cotton and Bike Friendly Oak Cliff. The Back Porch Studio is a project that supports community building through education and volunteer based design/build projects. 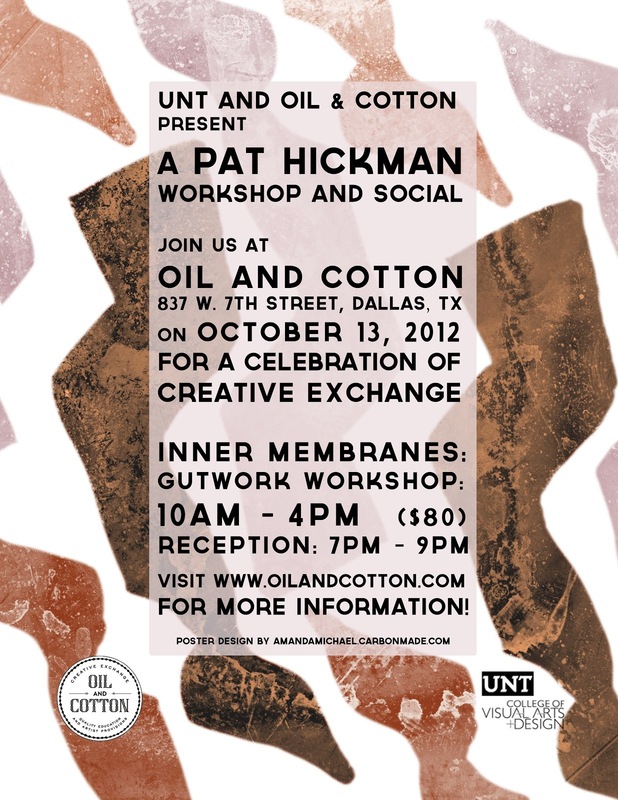 Oil and Cotton is learning studio dedicated to arts education. Bike Friendly Oak Cliff is an organization focused on creating a more bike friendly community. Aside from organizing family-friendly bike events and activities, one of their goals is to bring bike infrastructure to the community. This design competition is one of the steps taken toward that goal.The purpose of making this design available is to promote a bike-able community by making the racks easily accessible to small businesses. Design will be mindful of the "make do with what you got" philosophy and will be mindful of environmentally-friendly materials and processes. This means it is preferred that you think of materials that are repurposed, for example: using some sort of leftover material in a common fabrication process or something along those lines. Design will allow for either options in fixed racks or be modular to be able to hold various amounts of bikes. If it’s“fixed” think about whether it is a 3-4 bike rack or one that holds 8 bikes. The ideal would be a flexible design that would hold a different number of bikes depending on how many modules you build and put together. This would allow the builder to build as many as they need and add or remove modules seasonally. Materials will take into consideration how accessible the parts or materials are as well as how securely it holds the bikes. While wood may be readily and inexpensively available, it would not provide the most secure of racks. However, wood would be fine if you’re proposing that your rack be used indoors or the wood is only there to hold the bikes up but the locking mechanism is independent of it. Design does not have to provide all details of how to install the rack, but thought needs to be given to the fact that the rack will be used in many different scenarios. It may end up on a concrete sidewalk, a wooden deck, an asphalt driveway, a dirt alley, a wall or even maybe indoors! It is preferred that your design includes both floor-mounted and wall-mounted versions but it is not required. However, those designs submitted with both options or an option easily converted may be given special consideration. Please feel free to use the sheets found here to submit your final design. The pages are intended to standardize the submissions and ensure all needed information about the design is collected. Alternatively, you are allowed to submit your design using other drawing types (like 3D renderings or scale models) but please be sure to submit at least one side and one top view so that we can fairly compare it with the other design entries. Contact Fred Pena with questions. The Trading Tortoise will visit Oil and Cotton this Wednesday, October 17, from 6:30-8:30 pm. 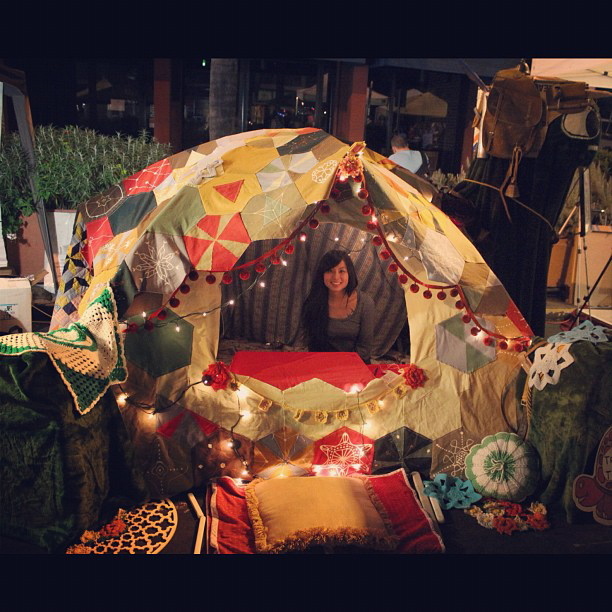 The Trading Tortoise is a traveling art project created by Souther Salazar & Monica Choy with the goal of creating a unique community experience while exploring America through objects and stories. Bring an object to trade...or make one here at Oil and Cotton. Salazar and Choy have created a sculptural installation (in the form of a large tortoise-shaped trading post) that they set up in different towns and cities throughout the nation. At each stop, they recreate their Trading Tortoise installation and invite people to bring a meaningful object, story or creation and exchange it for something else special that Salazar and Choy have found or traded for along the way. They hope to connect people in different places in America in this way, through a network of traded treasures and a mutual love of giving and receiving in a non-monetary exchange. invite you to a celebration of CREATIVE EXCHANGE. Please join us for a reception honoring visiting contemporary fiber artist Pat Hickman and the launch of our new partnership with the University of North Texas College of Visual Arts and Design. Oil and Cotton is happy to announce the formation of our new non-profit entity, the Creative Exchange, which serves to connect artists and institutions through thoughtful programming, teaching jobs for artists, and student scholarships.